For scientific journal articles the cost of publishing is almost exclusively covered by the articles that are accepted for publication. Either by the published authors or by the libraries. Advertisement and other items like the organization of conferences are probably not a very significant source of income. I don't want to argue here again the value of publishers and how we should be decoupling the costs of publishing (close to zero) from peer-review, accreditation and filtering. Instead I just want to explore the idea for a very obvious form a income that is not used - submission fees. Why don't journals charge all potential authors a fixed cost per submission, even if the article ends up being rejected ? I am sure publishers have considered this option and they have reached the conclusion that this is not viable. I would like to know why and maybe someone reading this can give a strong argument against. Hopefully someone from the publishing side that has crunched the numbers. The strongest reason against that I can imagine would be a reduction in submission rates. If only some publishers adopt this fee authors will send their papers to journals that don't charge for submission. Would the impact be that significant ? For journals with high-rejection rates this might even be useful since it would preferentially deter authors that are less confident about the value of their work. For journals with lower rejection rates the impact of the fee would be small since authors are less concerned with a rejection. 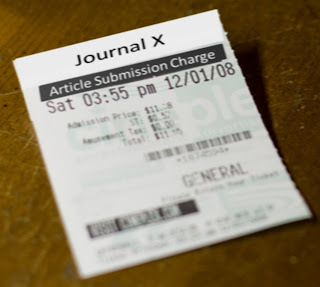 Publishers might even benefit from implementing a submission charge in the from of a lock-in effect if they do not charge when transferring articles between their journals. Publishers already use this practice of transferring articles and peer-review comments between their journals. It already functions as a form of lock-in since authors, wishing to avoid another lengthy round of peer-review, will tend to accept. If the submission fee is only charged once the authors are even more likely to keep the articles within the publisher. Given the current trend of publishers trying to own the full stack of high-to-low rejection rate journals these lock-in effects are going to be increasingly valuable. The overall benefit would be an increased viability of open access. A submission fee might also accelerate the decoupling of peer-review from the act of publishing. If we get used to paying separately for publishing and for submission/evaluation we might get used to having these activities performed by different entities. Finally, if it results also in less slicing into ever smaller publishable units we might all benefit. Update: Anna Sharman sent me a link to one of her blog posts where she covers this topic in much more detail.